1. Put the sugar, cardamom seeds and lemon juice in a small pan with 300ml water. Bring to the boil and simmer over a medium heat for a few minutes to dissolve the sugar. Add the apricots, bring back to the boil, then reduce the heat and simmer gently for 20-25 minutes. Transfer to a bowl to cool. 2. Drain the apricots, reserving the syrup. Carefully open up the apricots; they will already be cut, but you may need a small knife to pull them apart. 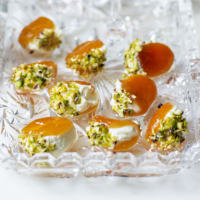 Fill each with 1 tsp mascarpone and dip into the chopped pistachios, then place in a single layer on a parchment-lined tray. Chill for 1 hour. 3. Arrange the apricots on a platter and drizzle with the syrup. Serve with toothpicks to avoid sticky fingers. Medjool dates make a great alternative to the apricots. You can prepare these up to six hours in advance; just cover with a sheet of parchment and wrap in cling film.